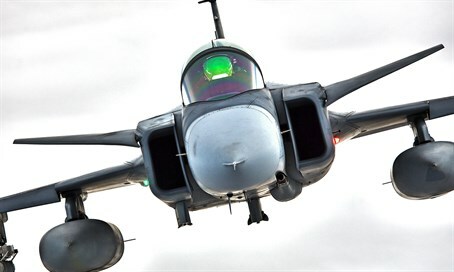 Arutz Sheva visits with the Hungarian Air Force mission in Lithuania. Recently, for the first time, the Hungarian Air Force deployed to Lithuania to assume the lead role in protecting the Baltic skies and NATO’s Northern flank from Russian aggression. This is my second visit to the rotation whose mission it is to protect Lithuania’s skies. During my last visit in February, tensions were already very high and now, with Russia embroiled in clashes not only in Ukraine but fighting a costly war in Syria as well, things aren't calmer. Even while Russian forces are fighting on two fronts, they still have a large enough military to continue to test NATO air defenses in the Baltic. The Rotation’s mission – protect the Baltic airspace from those incursions. The rotation has dropped 50% in strength since my last visit; instead of eight aircraft on the rotation, only five Hungarian JAS39 Gripens are currently detached to Sialuai Air Base in Lithuania. It is not clear if the cutback in forces was due to a NATO projection that incursions would be lighter, with the Russian military being occupied on so many fronts or due to the fact that NATO has been conducting many exercises over the past quarter including one of its largest ever, “Trident Juncture”, and thus strapped for aircraft needed to defend its skies. The Hungarian Air Force is no stranger to “Quick Reaction Alert” or QRA as it is more commonly known. The Hungarians perform this type of duty along its own borders as well as Slovenia’s and the approach they bring to protecting the Baltic is no different than protecting Hungary. Additional aircraft are stationed in Amari AB Estonia to provide added cover. These aircraft, German Air Force Eurofighter Typhoons, share the duties of patrolling the Baltic skies. I met Captain Viktor Lango, Chief of Operations for the Hungarian Air Force detachment, who is very forthcoming on his detachment’s mission. He stated that the detachment received very good feedback from NATO Command. Following familiarization flights, the HUNAF took over leading the mission on September 1st. Captain Lango noted that they had actually prepared for and expected a higher tempo of activity. Although he wouldn’t speculate to the reason, one can only suspect that Russia’s attention may have been a bit preoccupied with their deployment to Syria in support of Bashar Al-Assad’s regime. Lt.Col. Tamás Fekete, the Commander of the Hungarian BAP Detachment, gave us a glimpse as to what type of scenarios his men encounter in the Baltic. “Since we do the air policing procedures due to NATO regulations, our tasks in the Baltics are nearly the same as in Hungary or in Slovenia (from October 2014). In Hungary and Slovenia we usually intercept civilian aircrafts, here in the Baltics we have many more alpha scrambles and we often have to intercept military aircrafts,” he said. Lieutenant Colonel Marius Matulaitis, commander of Siaulai Air Base, stated that for the Lithuanian Air Force it is very much business as usual and they are prepared to provide logistic and operational support just like they do for every rotation that deploys to the base. Matulaitis stated that logistical flights were provided in effort to funnel the Hungarian detachment from Kecskemet Air Base in Hungary along with their equipment. He also noted the extreme makeover the base has gone under in recent years to bring it to its current more modern state. Both the Hungarian as well as the German Air Force detachment in Amari noted that they felt that they were well prepared for the mission due to NATO Command’s directive for preparation leading up to the deployment. Although tensions with Moscow have been high in recent months, there is a continued effort, it seems, by NATO to keep at least one aspect of Europe’s defense ready and alert.